Forget Great. How about Functional? MSNBC posted this graphic based on early information from The United States Election Project. Forget making America great. We have some work to do even to make America functional. Based on the votes counted so far, Donald Trump was elected by only about a quarter of eligible voters. Had Hillary Clinton won, the same would have been true of her. Nearly half the electorate, 44.6% as of the latest data, did not vote at all. That was the lowest since the 1996 election, which involved another Clinton who got a very different result (CNN Politics). Even if we account for those turned away in states like Wisconsin with strict voter ID laws, the numbers are abysmal. And many of those who did not vote actually do care about our country. They just couldn’t find it in themselves to support either of the major candidates, and it seemed pointless to cast a vote for the other two candidates on the ballot. For a democracy (or a republic) to function at its best, we need an educated and engaged electorate. We don’t have that. And the two major parties don’t really want to get out the vote for those whose votes they’re uncertain of; for obvious reasons they focus on getting out voters in their own parties who don’t consistently vote. After each election both parties rail against those who didn’t vote and blame each other for suppressing the vote or rigging the election. 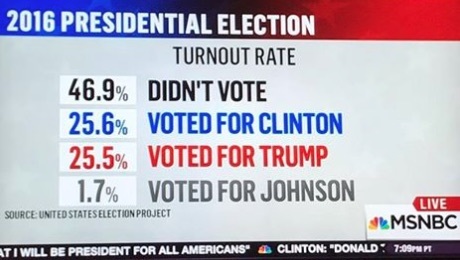 But we have little analysis of the reasons nearly 50% of eligible voters feel it is pointless even to show up at the polls. If we truly want to make America greater or even more functional before the next election, we should keep these non-voters at the forefront of every conversation. How do we get them engaged? Vocal Clinton voters—Stop labeling all who voted for Trump as racists and misogynists. While some most certainly are, it simply doesn’t make sense to believe that there isn’t a single rational person among the 60+ million Americans who voted for him. Progressive Christian Clinton voters—Keep caring about social justice but be just as loud for poor, white, rural Americans, who also need help and a voice. Silent Trump voters—Give up your vow of silence. You must call him out on the things that gave you pause and that kept you from speaking out for him, and you must especially demand that he denounce the hate groups that helped elect him. Evangelical Trump voters—You have elected what is perhaps the most un-Christlike man in the history of the presidency. It is now your responsibility to hold him accountable when he spews venom or behaves in ways that flout everything Christ stood for. Wealthy Trump voters—Ask yourselves at the beginning of each day, “How much is enough?” When will you have accumulated enough wealth to be willing to share it for the good of our democracy? Law enforcement Trump voters—Stop calling for more investigations of Clinton. She’s never going to be president now. Apply the same standard you’ve used for her to Trump, and insist that he, too, be held accountable. Non-voters–Vote! In the very next primary election! You will have more influence if you voice your opinion before the candidates pick up steam. If you can’t support any candidate, contact your party leaders and make your views known. The news media—Clearly delineate your news shows from your opinion and style pieces. Add a bias warning to all shows that are not strictly news journalism. On that last point, we all have some catching up to do. When print journalism and cable news were our primary sources of information, a reader could easily identify objective, credible news sources. America felt we could trust Walter Cronkite. And not once in 30 years of teaching did I ever have a student try to use the National Enquirer as a source to support an argument. The differences between the Enquirer and the Washington Post were obvious to everyone. In a digital environment, unreliable sources that have a biased agenda are harder to distinguish. Readers are often fooled by lovely graphic design and a tone of authority, even when the writers do not cite sources for the “facts” they present. In fact, teachers have found that students are just as apt to use information from this teacher created bogus site as they are to use credible sources. Adults are no better. How many people do you know, both Republican and Democrat, who shared sites that gave false information later debunked by fact-checkers and sites like Snopes? In fact, the day after the election, one of my liberal friends shared a post about Trump that had been debunked over a year ago. We all must learn to think deliberately and rationally and not to be duped by the first sound-bite that confirms our own political views. All of us, across the political spectrum, must take ownership for what we’ve done to our children’s psyches in this election cycle. Whatever you think the status of undocumented immigrants should be, we all have a responsibility to reassure children who are frightened by the rhetoric they’ve heard loudly and clearly in this campaign. We are, none of us, perfect. As human beings we are prone to sometimes speak before we think, to contradict ourselves in ways that give others power over us. But what if all of us tried just a little harder to give others the benefit of the doubt? What if all of us tried to find one hour a week to give our time to someone in need? What if each of us gently called out injustice when we are witness to it? We might begin to make our democracy more effective. And we might be able to keep the American Dream from turning into just another myth.